PHOTO BY STEVE E. MILLER FISH FINDERS: Joe Falcone, founder of Phondini Partners, met up with his local Outreach and Education employee Gayle Buffo in Morro Bay to showcase their new app Fishline. Over the past few years, the farm-to-table term has rapidly gained traction in our agricultural community. Restaurants compete at the weekly farmers markets for the freshest, locally grown fruits and vegetables to serve up in their most popular dishes. Well, that farm-to-table view just expanded with the FishLine app. The FishLine app offers the community, whether you’re a local or tourist, an easy way to find fresh fish from Half Moon Bay to Port San Luis. There’s no more wondering how long your “fresh fish” has been sitting in the supermarket, or if it’s been “enhanced.” Simply download the free FishLine app and buy fresh fish right off the boat, or from the closest fish market. The FishLine app was launched in March, and was created by Phondini Partners out of their Bay Area location. The original idea started with the Half Moon Bay ports, and the iCoastside app, but that app is limited, so the Phondini team created and expanded the FishLine app for not just Half Moon Bay, but also for Moss Landing, Santa Cruz, Monterey, Morro Bay, and Port San Luis. Since the FishLine app launched just six months ago, it’s not only broken into the top 100 Food and Drink app category in the USA, but is the number one sustainable, crab, fish, and seafood app in the iTunes Food and Drink category. It’s downloadable in all 50 states and more than 70 countries, and 40 percent of the downloads come from outside the community. The FishLine app is user friendly, listing not just where to find the fish, whether it’s at a market or right off the boat, but what type of fish it is, how long it’s been at its location, and the location details, like address, phone number, hours of operation, and what type of payment they will accept. The FishLine app even gives the weather, marine forecast, tides, surf, and CHP Alerts; heck, it even gives a breakdown on humidity, wind, rainfall, cloud coverage, and swells. The FishLine app is so much more than just trying to find and buy fresh fish, though; it also offers recipes, and restaurants that serve fresh, local fish if you want to take a night off from cooking. FishLine app also helps portray our “local color” by presenting the biographies of the actual fishermen who are out there catching your next meal. It makes me think of a time I never lived in: When the neighborhood knew the milk man and paper boy, and the bag boy at the closest grocery store was more than just another college kid earning money just to party. FishLine is just getting started though. Joe Falcone, CTO, and managing partner and founder of Phondini Partners, wants to eventually expand the app to have the whole West Coast included. That evolution is still some time off, though, since they don’t want to water down the local color and history of the ports. 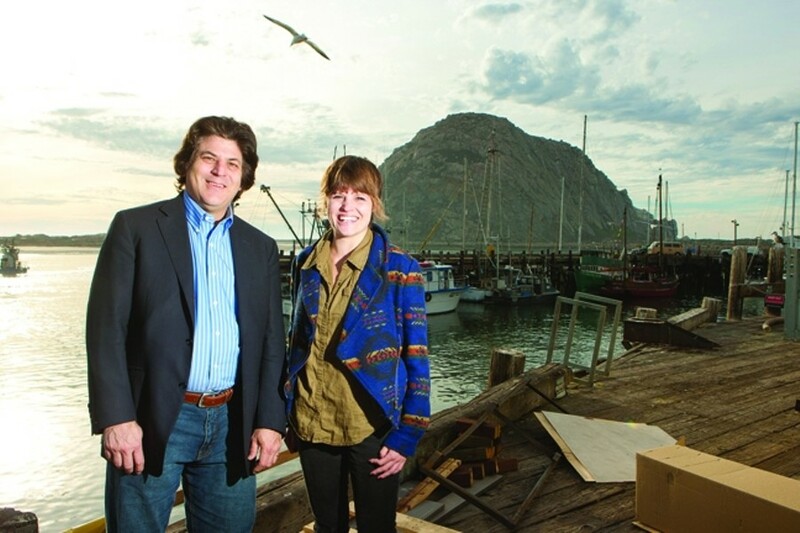 “Morro Bay is a part of our culture, part of American history,” Falcone said of wanting to expand the app without losing the culture and history of both the ports and the fishermen. There’s also talk of creating a FishLine Jr. to educate kids about how fish is caught and where it comes from. Falcone and the Phondini team also thought about all the non-smartphone users, and created a website with all the same information. No more driving back and forth from your house to the harbor to check out the white board specials and catches; simply log onto fishlineapp.com, or download the free app onto your phone and see what our coast has to offer. You can even like them on facebook at facebook.com/FishlineApp. The Feline Network of the Central Coast is looking for donations for all those kitties that still don’t have a home. Drop off any kitty-related items, like beds, treats, dry or canned food, litter, carriers and cleaning supplies at the Petco in the Madonna Plaza shopping center or call 549-9228 to send cash donations.